Felchlin’s Maracaibo Clasificado 65% couverture was named the best couverture by the Italian Pastry Academy. A pure Grand Cru Chocolate made of Criollo beans from Sur del Lago, Maracaibo, Venezuela, it has aromas of coffee and plum and notes of orange blossom, cinnamon and raisin. Visit Felchlin.com for more information. This is Page 1 of a four-page article on couverture chocolate. Click on the black links below to visit other pages. Couverture (French for coating or covering) chocolate is the basis of all chocolate, as grapes are the basis of wine. It is professional-quality chocolate that is used for tempering and making bonbons, truffles and chocolate bars, or enrobing other confections (chocolate-covered pretzels and marshmallows, e.g.). If you are a serious student of chocolate and want to understand why you prefer one brand over another, you need to learn your couvertures—and the companies that make them. 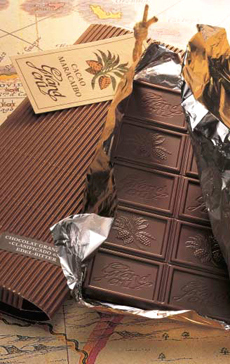 *Fine chocolatiers, of course, make their chocolate bars from the same quality couverture. Couverture won’t be confused for a candy bar: it is made in kilo (2.2 pound) to 10 pound bars or blocks. Some companies make smaller bars and “wafers,” discs smaller than a quarter, for the home baker and chocolatier.